The Accessible Recruitment Guide was created by Media Access Australia to provide practical ‘real world’ guidance on how best to address accessibility-related issues in recruitment and human resources management. This handy summary covers everything from checking that you have an accessible Position Description; to making sure that online forms for reference checks or self-application are accessible to people with cognitive, vision or mobility disability; along with handy tips for improving accessible recruitment processes that you can implement immediately. 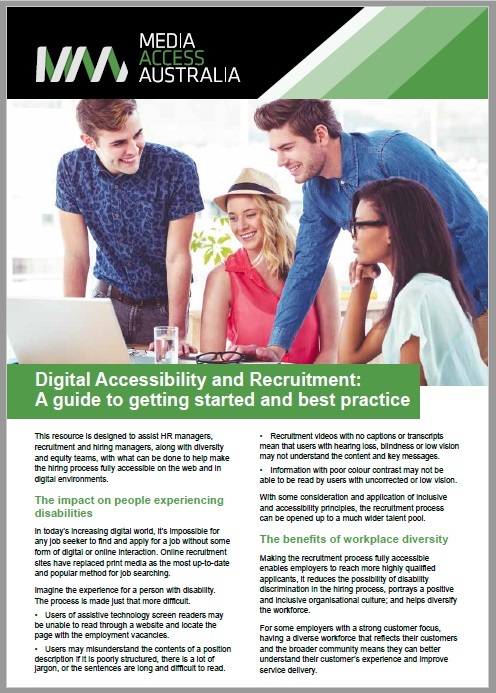 As a Guide to getting started and best practice, this resource is designed to assist HR managers, recruitment specialists and hiring managers, along with disability advocates and diversity & equity teams, in regards to what can be done to help make the hiring process fully accessible on the web and in digital environments. What’s more, the benefits of accessibility also flow on to increased staff satisfaction as well as personnel retention rates. You can download this Guide at no cost by completing the form below. I understand and accept that I may be emailed about an update to this Guide or a related information Guide from Media Access Australia at some stage in the future. By clicking Submit, I also accept to receive the MAA newsletter, which I can unsubscribe from at any time. If you are having difficulties in downloading this Guide and/or are already a Subscriber to the MAA newsletter, please drop us a line at comms@mediaaccess.org.au and we will quickly resolve the issue for you. For enquiries about this Guide or web and digital accessibility services like web access audits, document remediation or for in-house access training, please email info@mediaaccess.org.au or call 02 9212 6242 M-F from 8:30am to 5pm.